In today’s Gospel, the mountain is a place of prayer outside of the everyday world where a luminescent encounter with God takes place. It is high up on this mountain where the face of Jesus “shone like the sun and his clothes became white as light.” Savoring the grace of this experience, Peter says, “It is good that we are here.” Then the disciples became fearful at the sound of a voice saying “This is my beloved Son, with whom I am well pleased; listen to Him.” Jesus tells the disciples not to be afraid and they come down from the mountain. I have always admired the night sky and the moon. I have often found myself in awe as I gaze at the light of the moon, especially a full moon. The moon lights up because its surface reflects the light from the sun like a mirror. In our quest to follow Jesus more closely, we must be like the moon by serving as a mirror reflecting the light onto the Earth…Christ’s light. Working as an Education Assistant, I was often challenged with motivating disadvantaged young adults to study and perform well academically. I sometimes questioned if I was serving as a reflection of Christ’s light when working with specific young adults who exhibited more struggles than others. Sometimes it felt as if my efforts were not making a difference, but observing the light in their eyes as they became excited about learning spoke otherwise. The light in the faces of those around me was a reminder that Christ’s light was indeed shining brightly through my service. In prayer and service I was often invited to have my own transfiguration. 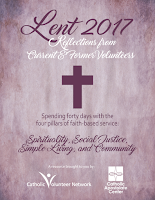 As we show love for God and our neighbor, personal transfigurations occur when we mirror God in our daily lives in good works and faith. Like the moon, be a reflection of Christ’s face shining on us like the sun this Transfiguration Sunday! 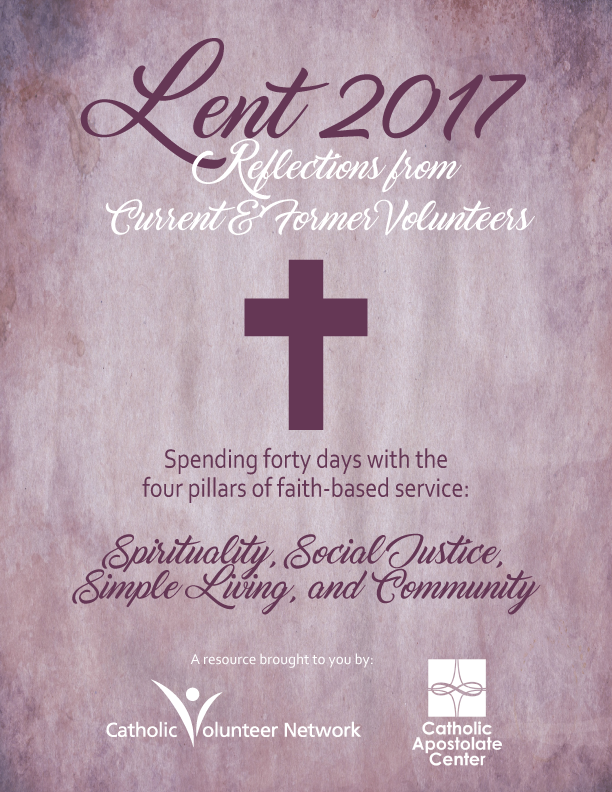 God of Light, As we continue our Lenten journey together, we thank You for the gifts of encounter on the mountaintop with You. Thank You for inviting us to our own transfigurations with the divine light of Your face. Help us to be aware of the radiance You bring into our daily lives so that we may be a reflection like the moon. Let our faith and good works light a new light in the hearts of our community and those we serve. Amen. Focus on: Community: One of the highlights of living in community is praying together. This is a time when the community has the opportunity to journey up the mountain together just like the disciples did in today’s Gospel. As a community, find your mountaintop to pray, listen deeply, and savor the graces you have received together. Your mountaintop may be a special place in your home or a beautiful place out in nature. Wherever your place of encounter may be, remind each other daily of the beautiful encounters with God you all have experienced on your mountaintop. Come down from your mountaintop poised to change the world! What’s your mountain? What’s your place of encounter with God? Service Inspiration: Sr. Mary Rogers is a Sister of St. Joseph of Orange and is a beautiful example of what it means to reflect the light of Christ on the world with faith and good works. She motivates me to serve others because her dream has always been to serve in communities and schools of great need. She is an educator who has always taught with energy and enthusiasm while showing great compassion and love for students. I currently find myself teaching in a community of great need and I often reflect daily by asking myself this question: Did I show students love and compassion today like Sr. Mary would? About the Author: Celina Roybal grew up in the rural community of Medanales, New Mexico just north of Santa Fe. In 2015-2016, she served as a St. Joseph Worker of Orange as an Education Assistant at Taller San Jose Hope Builders in California. She currently teaches Physical Education at Abiquiu Elementary School and Hernandez Elementary School in New Mexico. Her favorite books are My Sisters the Saints by Colleen Campbell and Sum It Up by Pat Summitt.Celina enjoys the outdoors, playing and coaching sports, and cheering on the Denver Broncos.